OK, super cool party people and anyone in the DC area who may come to my house for a happy hour in the near future, I have something I think you’ll like. 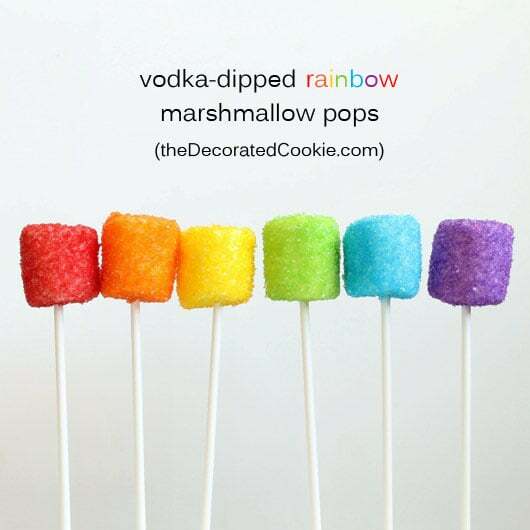 Vodka rainbow marshmallows pops. Well, vodka-dipped. It’s a colorful cocktail and dessert in one, and on a stick no less. And sparkly. And rainbow. Perfect for a grown-up My Little Pony party. I did fancy myself brilliant when the bizarre train of thought in my head stopped at these. Though truthfully, I don’t know what happens to the alcohol in vodka when it dries. So I got to test them out in the middle of the day to make sure they still tasted alcohol-y after a few hours. They do. I even tried them the next morning. (Vodka for breakfast!) They still work. I don’t know how many you’d have to consume to make a dent in your sobriety though. 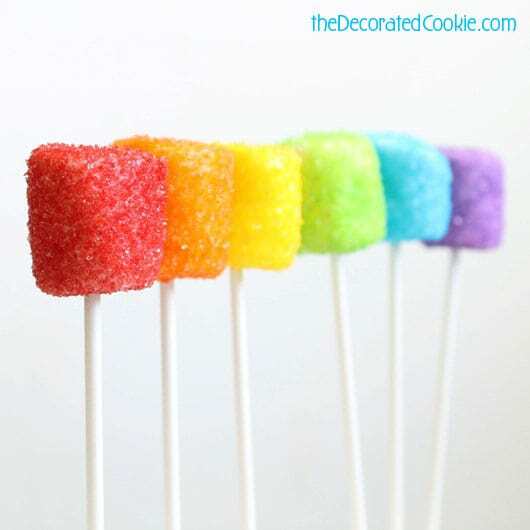 But I still call them “drunken.” You can also call them “boozy” rainbow marshmallow pops. UPDATE: A couple years later, I’m adding some video how-tos for you. The full, written instructions are below, as are links to supplies. Enjoy! 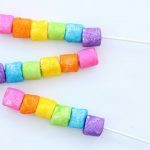 I used the same method of creating sparkle marshmallow pops I’ve used for years, starting with these sprinkle marshmallow pops HERE. 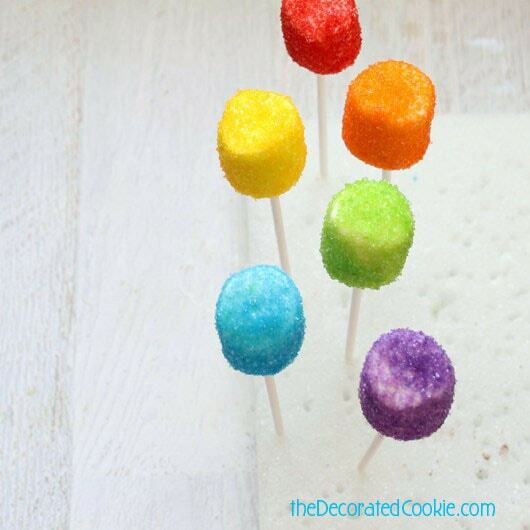 Then these Valentine’s Day sprinkle marshmallow pops HERE. 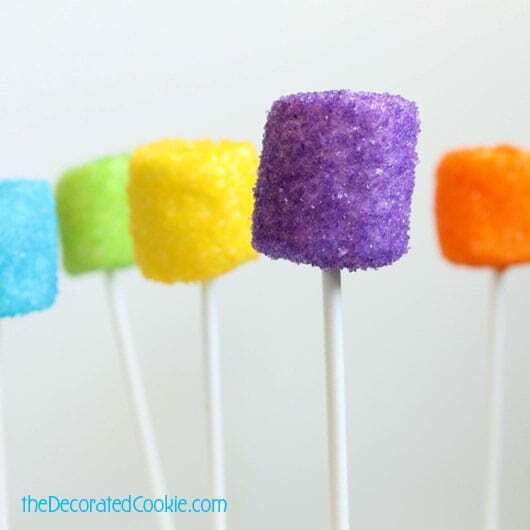 Then these video how-tos for sprinkle marshmallow pops HERE. 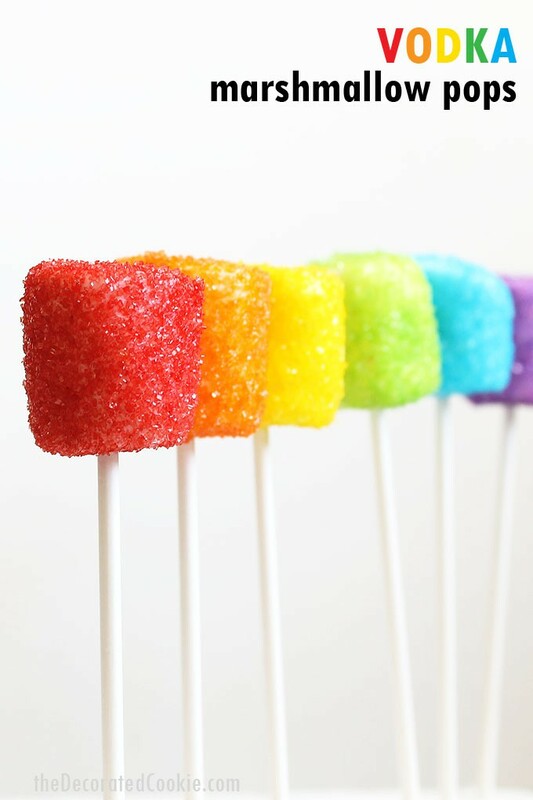 And don’t forget those rainbow marshmallow kebobs. Only this time I replaced the water with vodka. So easy and drunk-like. And if you have kids around, you can of course make some the old-fashioned way, with water instead of vodka. But they look exactly alike, so pleeeeeease label them well so I don’t have angry parents writing me angry emails. Next time, I’m trying these with gin. 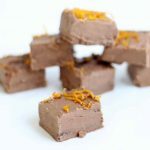 And by the way, if you like these, check out my BOOZY FUDGE. 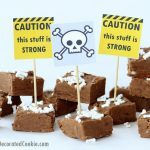 My favorites so far are the tequila fudge shots. 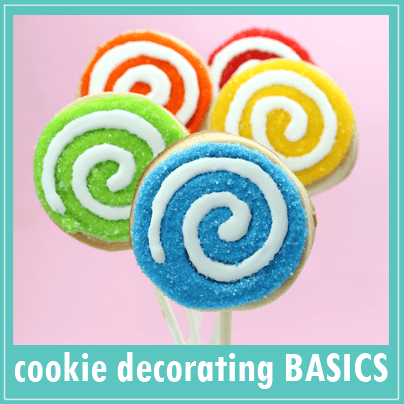 *Find the Styrofoam block, lollipop sticks and sprinkles in every color at the craft store. 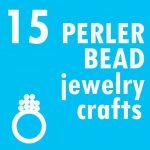 Or, see below for affiliate links to supplies. what to do: Pour vodka in a cup. I used a small, 8-ounce mason jar as that minimized vodka waste because it’s so narrow. You need only pour in about 2-ounces. 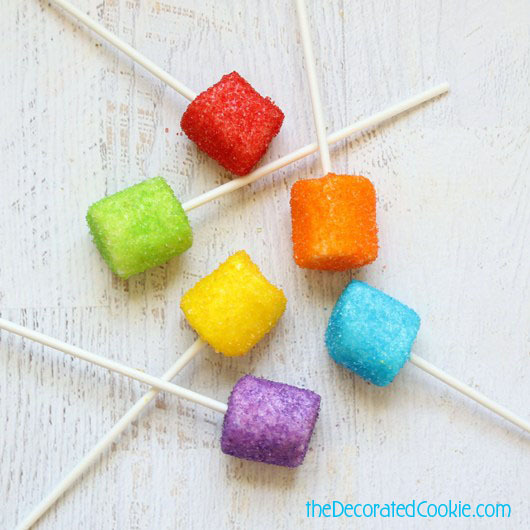 Skewer a marshmallow with a lollipop stick. Submerge the marshmallow in the vodka, remove and tap the stick on the edge of the jar to shake any excess vodka from the marshmallow. Hold the marshmallow over an empty bowl. 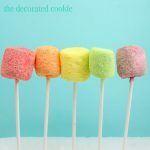 Shake sprinkles over the wet marshmallow to generously coat the marshmallow. Prop the marshmallow in the Styrofoam block to dry. Repeat with any desired colors. I sure wish I liked marshmallows? I love marshmallow creme…but don’t really care for marshmallows unless their toasted. But a great idea for a party and friends who do like them. They could make a nice arrangement for a centerpiece. 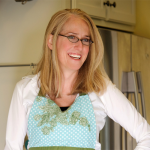 Thanks so much Terrie! I’m an only-sometimes-love marshmallows person. Only I would definitely opt for chocolate or cookies given the choice :). 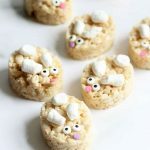 these are super cute and a great idea. thanks for sharing! anything is better with vodka i swear! Thank you Thalia! What a great motto, too :). How long do you leave them in the vodka? This would make a pretty bouquet for a new mom. Like wine in my house, Gail… never a drop left! I dip quickly in the vodka, just enough to submerge, then remove, shake off excess and coat with sprinkles. I think too long in the vodka will over-soak the marshmallow to a mess, BUT next time I’m going to try submerging them for a few seconds at least to soak up more vodka. I’ll try 10 seconds. How soon before the day can you make these without them spoiling? Planning on making them today (thursday) for Saturday night. 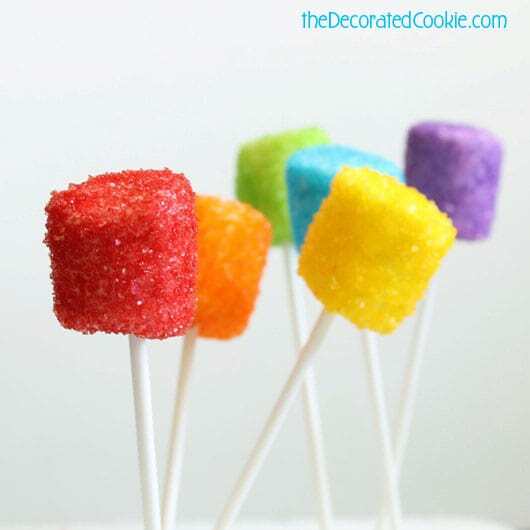 I made them, let them dry in the Styrofoam block a couple hours, then got a big, shallow tupperware container, placed a piece of parchment on the bottom and placed the pops on that and sealed them. Lasted 4 or 5 days. Didn’t taste very vodka-y after a couple days. I probably would have let the marshmallows soak up just a bit more (maybe a few more seconds in there). 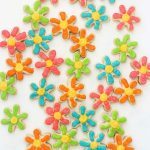 These are great for kids party because they are so colorful. Exactly! Minus the vodka, I guess. But you can absolutely use water instead! A Friend shared this with me tagged in it – everything is better with Vodka! I intend to do them ASAP and also use them at my OH 60th Birthday Party later this year, I may try them with other spirits for those who don’t like Vodka (there are a few people out there who don’t) and also so I can keep the Vodka ones for me! LOVE it Maggie! I was actually just thinking this morning of testing it out with other liquors. I’m a gin drinker myself :). I am wondering how many days ahead of party that these can be made and still be good. Also what an approximate soak time would be to not ruin the marshmallow. Any suggestions ? Every year we have an Alumni Softball game for my high school. It has become a tradition to make Jell-O shots, but thought these would be a good addition to the “game”. 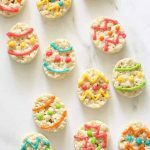 Hi Debby, You can make these up to 3 days ahead if kept in a sealed container (the sprinkles form a kind of coating so the marshmallow stays soft). Although the closer to the event you make them, the more the vodka will remain. They aren’t super-alcohol-y, not as much as a jello shot. You can soak them in the vodka, but not more than about 10 seconds or so. Hi DeeDee, you only need to dunk them in and remove them, you don’t need to leave them in the vodka at all for the vodka taste. 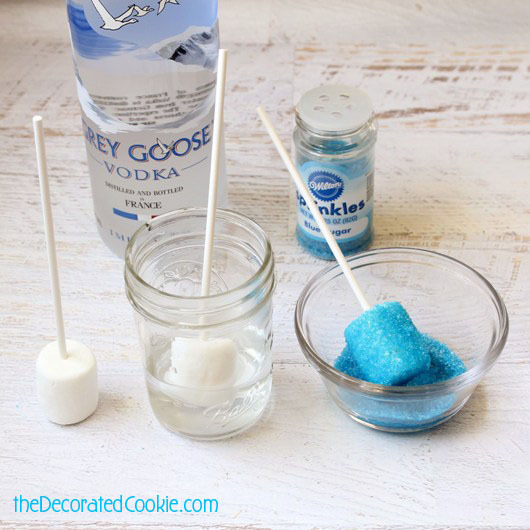 But if you want more alcohol in the marshmallow, you can dunk and hold the marshmallow in the vodka for a few seconds. I’d say max of 10 seconds though, or they will get too soggy. Hi Michelle, you can! The liquid may dissolve the powder a bit, so it won’t have that sparkly thing, but it does work! Have ypu used flavored vodka? If so best flavor to use? These don’t need to be refrigerated at all once dipped? Just curious if the sealed container is good enough at a good house temp. How long is the dry time once dipped? Thanks! Hi Angela, Nope! No refrigeration necessary! Room temp is totally fine. They usually dry in about 30 minutes. 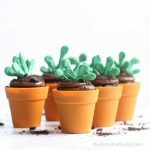 I place them on a piece of parchment in a big tupperware container so that they don’t overlap each other too much, just in case they are a little wet. The sprinkles/vodka form a kind of shell around the marshmallows to keep them soft inside for a few days.